Millennials, myself included, have a bad habit of complaining that #AdultingIsHard. A simple hashtag search of that on Twitter will get you literally thousands of results, even a few accounts with that claim as their usernames. It’s a trope so ingrained into my generation that it can be used almost anywhere. You finally graduated from college, but now you have to start paying down those ridiculous student loans you chose to take on? Adulting is hard. You loaded the dishwasher but forgot to press start to run it so now you have to use your third favorite Yeti tumbler for your morning pour-over? Adulting is hard. Seriously, y’all. Stop. “Adulting” is not that hard. You got a little too drunk at the bar and walked into a light pole on the way back home? Adulting is hard. You just got paid, but it all goes to rent because you didn’t budget properly and spent all of your disposable income on artisanal cocktails and avocado toast last week? Adulting is hard. Seriously, y’all. Stop. “Adulting” is not that hard. It’s a realization I came to pretty recently as I inexorably march toward my thirty-fourth birthday. In fact, not only is adulting not really all that hard, it’s actually fairly enjoyable once you manage to make it a habit. I’m willing to grant that maybe I had a head start in all of this. After all, I was only 18 when I was diagnosed with an incurable, chronic medical condition. I was a mother at 26 and a wife at 27. I’m a homeowner and a dog owner and a career woman with a great job and a lot of friends. A fantastic husband with his own great job is also a solid contributor to my willingness to embrace adulthood. But these things weren’t always the case. I’ve been bad at budgeting, I’ve made poor life choices, I’ve made awful dating decisions. Becoming the adult I am today took years of work and trial and error. So, let me help you learn from my mistakes. 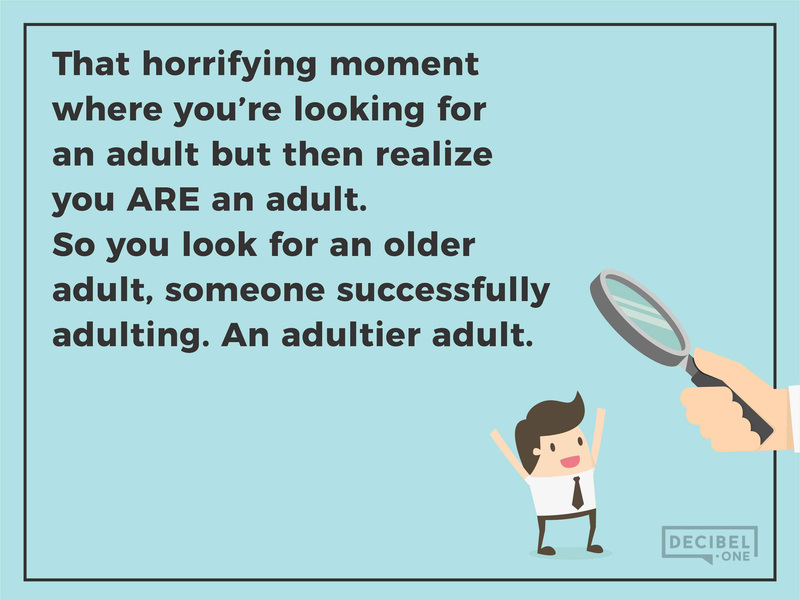 But what does “adulting” even mean? According to the internet, “Adulting is the assumption of tasks, responsibilities and behaviors traditionally associated with normal grown-up life.” Activities that fall under the heading of “adulting” include, but are not limited to, having a steady job, generalized housework, paying bills and budgeting, getting enough sleep, buying or renting your own home, and parenting. These are basic required activities that every other generation has managed to do without inventing a new term to describe them. Do you go to a steady nine-to-five gig? That’s adulting. Do you clean your room, do your laundry, wash your dishes? That’s adulting. Do you manage to pay your rent/mortgage on time each month? That’s adulting. Despite my millennial-ness, these things don’t sound like they’re all that difficult. Okay, maybe they’re not all that much fun, but they are critical aspects of being a functional member of society. In fact, these are basic required activities that every other previous generation has managed to accomplish without inventing a new term to describe them. So, how is it that “adulting” became so hard for us? The widespread phenomenon of “helicopter parenting” really began gaining steam in the mid-1980s. Coincidentally, this is also around the time the generation now known as millennials started being born. Due to overzealous parenting, many millennials were never actually exposed to any real challenges in childhood. In essence, helicopter parenting is a kind of overparenting in which the parent(s) take over an inappropriate amount of responsibility in their children’s lives. You know the kind. The mom who calls the teacher, demanding that her precious angel’s C-minus be changed to an A-plus. The dad who insists that his progeny be granted a starting position on the sports team regardless of his skill level. The parents who overschedule and micromanage every conceivable aspect of their precious, unique snowflakes’ lives. And yes, I’m fully aware of the connotations of the word “snowflake” in that last sentence. For as much as it has become a term that is somewhere between a joke and a slur, even with its newly implied meanings, it’s definitely an appropriate use case here. After all, who did the population-at-large begin accusing of being snowflakes in the first place? Oh, right. Millennials. And they’re not exactly wrong about that, either. Due to overzealous parenting, many millennials were never actually exposed to any real challenges in childhood. Our parents made sure we always “succeeded,” regardless of the actual outcome of our endeavors. We got our participation trophies, were roundly assured that we were all winners, and went off to our next parentally-scheduled activity. We were promised that it was the thought that counted, that just trying was what was important, that we were special and valuable just the way we were, and that we could be anything we wanted to be just by virtue of existing. Anything that challenged that rosy worldview was quickly and emphatically swatted away for us by our doting parents. Every setback, every responsibility that we never learned because our parents always did it for us is a disaster of the highest order. Fast forward a couple of decades, and suddenly you have millions of legal adults who don’t know how to fold their own clothes or schedule a doctor’s appointment, much less ones who have the mental and emotional fortitude to handle constructive criticism at work or, heaven forbid, failing to get the job at all. This has led to an epidemic of victimhood, where any potential disagreement is construed as violence and must not be tolerated. Every setback, every hardship, every responsibility that we never learned because our parents always did it for us is a disaster of the highest order. If you really want to know why a majority of millennials prefer socialism, look no further than this. We were frequently raised with having all of our wants and needs taken care of by another party. It’s fine, Daddy will pay off my credit card bill. Mom will do my laundry when I come home for a visit. Having the state handle all the difficult decisions about day-to-day life isn’t such a stretch when the above is all you’ve known. So, what’s a millennial to do? How do we undo our past conditioning and become adultier adults? I have some suggestions. These are what have worked for me. And because of them, I’ve discovered that being an adult is actually pretty rad. Maybe these are right up your alley, and maybe not. Everyone’s different. Start with not going out to eat. Not only will it save you money and improve your cooking skills, you’ll learn to plan ahead and delay gratification when it comes to food. When you have to decide what to eat during the upcoming week, go to the grocery store, keep said groceries somewhere, and then prepare your meals yourself, you’ll be learning a lot of valuable skills: budgeting, time management, delayed gratification, and nutrition. And who knows? Like me, you might find that you really enjoy cooking. When you feel overwhelmed, being able to make a tangible change in your environment can give you a vital sense of control. Next, keep a detailed calendar. Do not rely on your own memory for keeping appointments and deadlines straight. It won’t work. There are any number of calendar applications you can use, and a lot of them are free. Even physical planners are making a comeback, if you prefer to work with pen and paper. Have a meeting? Put it in the calendar. Have a project due? Put it in the calendar. Going to the doctor? Put it in the calendar. Birthdays, holidays, vacations, business trips, reminders, all of it. Put it in the calendar. This will prevent you from double-booking or overextending yourself. And if you’re being honest with yourself about how long each of these things in your calendar takes, you’re already well on your way to better time management. Keep a clean living space. This is one that I openly admit I struggle with. Between the dog and the seven-year-old boys (not to mention my own dislike for the task), my house is pretty much never ready to be on a spread for Better Homes and Gardens. But my husband and I (and my kids) do at least try to keep it mostly presentable. There’s a good reason that popular psychologist Jordan B. Peterson encourages his listeners and students to clean their rooms. When you feel overwhelmed and overpowered, being able to make a tangible change in your environment can give you a vital sense of control that you may not have known you were lacking. And, perhaps most importantly, stop lying. To yourself and to others. This means not only celebrating your successes, but also owning your failures. Blaming others for your mistakes and poor decisions does no one any favors, least of all you. When something you’re working on doesn’t go as planned, even if it’s not necessarily your fault, it is your responsibility. So accept it. Recently, I wasn’t doing my job well. I wasn’t communicating properly with my project partner, and we’d fallen way behind. Instead of blaming the fact that I’d been out of the office for a while or that I was nowhere near inbox zero so his missives got lost in the shuffle, I openly admitted to him and our supervisor that I’d been a terrible partner and that it was my fault. I apologized and set out to fix the problem. My willingness to admit my wrongdoing and remedy the situation got me way more respect and understanding than ignoring it or making excuses ever would have. In the process of doing what was needed to move the project along, I got to expand and improve my abilities as a writer, and my relationship with my partner is now better than ever. All because I told the truth and followed through on what I needed to do. There are myriad other ways to improve your adulting skills and numerous other sources of advice. I mean, we have an entire industry dedicated to self-help and personal growth. There’s a reason the “podcast bros”—as the New York Times calls them—like Jordan B. Peterson, Tim Ferriss, and Joe Rogan are so successful. But more than anything else, the overarching themes of “how to be an adult” can be distilled down into personal responsibility and self-discipline. I believe in you, fam. You can do the thing. So go do it. I can give you all of the advice, shortcuts, and neat little tricks in the world, but it doesn’t matter a whit if you’re not willing to do the work. I can’t make these changes for you, and that’s the entire point. If you genuinely want to embrace and enjoy adulthood, if you’re serious about shedding your bad habits and harmful childhood conditioning, then you’re going to have to put in the effort. Since we’ve established that I’ve stopped lying, believe me when I say that this is a process that will take time and effort. It is ever ongoing. As no one of us is perfect, you will fail from time to time. I know I do. But the goal in life is not to make no mistakes. It’s to learn from them. Once you have accepted responsibility for your own life and actions, once you realize that it’s up to you to improve your life, the act of “adulting” holds a lot more appeal. A few small behavioral changes, a little readjusting of expectations, and suddenly it won’t seem like such a challenge. And in doing these, you’ll find that you actually enjoy being a grown-up.